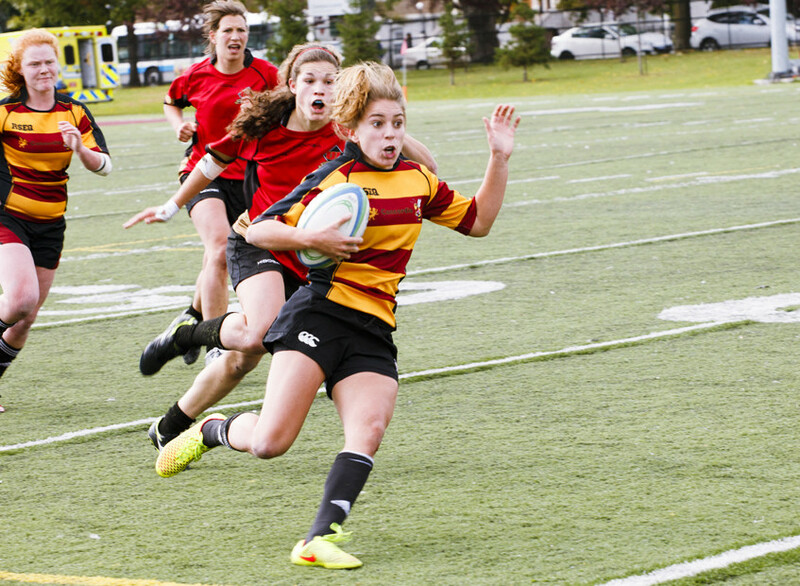 Last year the Stingers women’s rugby team came so close to having their dreams of winning the conference become a reality, only to be devastated by their biggest competition, the Ottawa Gee-Gees. As preseason begins, Coach Graeme McGravie forms his winning team with high hopes as well as high expectations. Placed in one of the toughest conferences with teams such as the Ottawa Gee-Gees, Université de Montréal Carabins and McGill Martlets all vying for the coveted conference title, there is no slack time for the women Stingers. Despite the opposition, the women on the team have such a seamless relationship on and off the field. “[I’m looking forward to] spending more time with the team and forming tight bonds with rookies as well as returning players,” said returning star player, Frédérique Rajotte. McGravie is confident in his team’s history of winning. “The pressure to repeat and continue that reputation is one of the factors that motivates the team,” McGravie comments. Jenna Thompson, another star player, says she is eagerly awaiting the rematch between the Stingers and the Gee-Gees. To know that the winning banner and trophy could have been showcased in the school gym by now, but isn’t, is all the motivation she needs to push herself past limits she never taught possible. Tessier believes that the team has a strong lead here in Québec and they can face any team. “[I’m not] focusing on any other teams and what they may or may not have to bring to the field,” said Alex Tessier, who returns after playing with Team Canada women’s rugby team over the summer. She later added that all her focus is on her team and what they can do this year. Rajotte has observed the possible rookies during training camp and has seen great potential for some very speedy backs. Rajotte believes that more speedy backs would be a great asset to the team. The women’s rugby team will host their first game post preseason tour on Sept. 8 versus Carleton.